The VL1000 is a Normally Closed Pneumatic Valve used primarily to control the on/off flow of water for pure water and abrasive applications. Designed for versatility, the VL1000 is interchangeable with most WSI abrasive cutting heads and can easily be substituted for pneumatic valves on most existing systems. Its economical design is characterized by proprietary seal materials delivering the longest seal life in the industry and its utilization of a reversible (life doubling) seat. A powerful single actuator spring provides fast and reliable response times during rapid on/off cycles and reduces the number of fatigue parts in the valve. Unlike other industry valves, the "Safe Release" actuator design places the control of rebuilding the valve safely back in the hands of the maintenance staff. Normally closed design provides fail-safe operation, shutting off the waterjet if electricity or air pressure fail. High speed response when opening or closing. Designed for high frequency operation - with the maximum cycle performance offered. Economical by design - very low maintenance cost due to features such as a reversible (life doubling) seat, which can be replaced independently of the nozzle tube. Simple construction accommodates easy field maintenance. 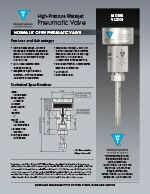 The VL2000 is a Normally Open Pneumatic Valve, meaning it rests naturally in the "open" position. Designed without spring loaded tension, the valve is used primarily as a safety "dump" valve but is also a favorite in the robotics and automotive industries where high cycle reliability and high-speed response is paramount. The economical design of the VL2000 is characterized by the same high-cycle proprietary seal materials as our VL1000 cutting head and by the cost-saving reversible (life doubling) seat which makes our valves industry-unique. Normally open design - primarily for use as a blowdown valve where loss of air pressure causes the valve to open and blow down the high pressure lines.